In terms of Doom Death Metal, we could say that the style has two defining points in time: the birth of it in the beginning of the 90s with bands like PARADISE LOST, MY DYING BRIDE and ANATHEMA, all of those following a more Progressive/Gothic sound after two or three albums; and the coming of a second generation, when OPETH and KATATONIA, in their earlier works, did something new, putting elegant parts under the brutal and depressive sound structures. 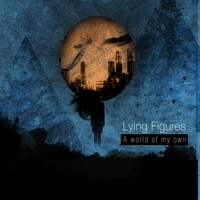 And we can say that the French quintet LYING FIGURES follows the same trend from albums like “Brave Murder Day”, “Turns Loose the Swans” and MOONSPELL’s “Irreligious” on their new EP, “A World of My Own”. Here, the weight and harsh tunes of Doom Death Metal meets with the elegance of Gothic influences on their music. It’s slow, heavy and bitter, but with very good beautiful Gothic moments. And one very strange feature about the band: it's very different compared to their colleagues in terms of style as they don't write so long songs, barely reaching 4 minutes. But that’s enough for us to catch the band’s musical identity: Doom Death Metal with Gothic touches. The vocals use depressive tunes along with harsh voices; the guitar riffs are very good and highly atmospheric, using a rhythmic kitchen of good technique, but with a heavy weight. And that forms a pretty good musical work. We can hear a clean and heavy sound coming from the speakers, showing a good sound quality. It could be better (because it’s a bit harsher than the necessary), but it’s good as it is, clear to the point you can understand what they’re playing. I can say that all the six songs of the EP are in a very good shape to our ears. But of course you can have better moments on songs like the depressive and tender “Taste of Ignorance” (in a trend that really reminds us of something MOONSPELL did on “Irreligious” era, but without being a clone of them, with a very good mix between clean and raw voices), the long “Until It Ends” (another very introspective song, this time, with a very good work done by the guitars), and “Of All the Western Stars”, that has a very good work of the rhythmic session, along with a slower tempo, that gives the song a bitter taste.